I know that bucket lists are supposed to contain bungee jumps, trips to Pacific Islands and conjugal visits with film stars, but for a good few thousand people last night, seeing David Gilmour play “Shine On You Crazy Diamond” pretty much topped all that. 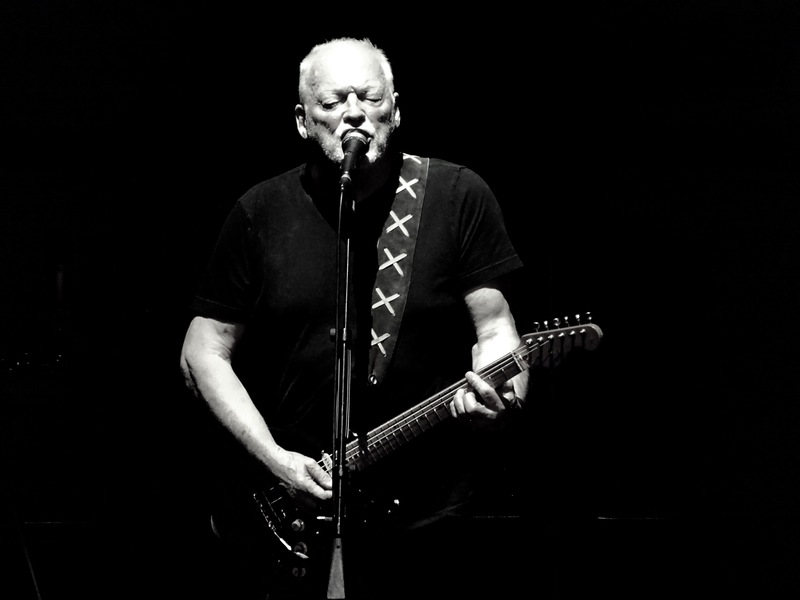 Last night was the second of five dates of David Gilmour’s residence at The Royal Albert Hall, a venue where Gilmour has played both as solo artist and with his former band, Pink Floyd. Gilmour is not the most prolific solo artist. Indeed, there are probably sloths in the South American rainforest which have managed more than four solo albums in thirty-seven years…. It has been nine years since Gilmour’s last solo album, 2006’s “On An Island”. Gilmour says wryly, “in the later part of my career I feel it’s fine for me to work in a slightly less defiantly ambitious way”. My previous glimpses of Gilmour have been fleeting. He joined Jools Holland onstage for a song or two at the RAH in 2004 as part of the Teenage Cancer Trust season. More memorable was a fortunate evening I spent at the O2 Arena when he joined Roger Waters during the latter’s performance of “The Wall”. But Pink Floyd is now gone for good, much to Gilmour’s relief it would seem. Although he says “it was never really an ambition to be a solo artist”, it is clear that he and Waters see eye to eye on very little. Post the 2005 Live8 reformation, a final tribute to Rick Wright “The Endless River”, was released this year without Waters’ input and reached the top of the UK album charts. Nothing from that last album is played tonight, and Rick Wright’s signature tunes “The Great Gig In The Sky” and “Echoes” are retired. Perhaps by finally leaving behind any thought of reforming Pink Floyd, David has gone from Hippy Gilmour to Happy Gilmour. Although there is an absence of anything from “Endless River”, new tracks from Gilmour’s latest LP “Rattle That Lock” are played, alongside a thorough revisiting of the Pink Floyd back catalogue. The first thing that strikes you about David Gilmour is how distinctive his playing is. Perhaps only a handful of guitarists – Jimi Hendrix, Chuck Berry, Eddie Van Halen, BB King and Billy Gibbons are similarly recognisable. This is something that is abundantly clear as we listen to Gilmour’s set. I’m expecting “Shine On You Crazy Diamond” to send shivers down my spine (it does) but tonight’s version of “Us and Them” is a revelation. Throughout the show, behind the band, which includes Phil Manzanera on guitar, is a circular projection screen, upon which in true Pink Floyd tradition we see short films, animation and Alice in Wonderland visuals. During “Us and Them” a film plays which, judging by the haircuts and kipper ties, was from a seventies Floyd tour, it’s an absolute, extraordinary highlight. This is as close as we will get to seeing Floyd in 2015, Roger Waters’ “The Wall” notwithstanding. Other highlights include early Floyd track “Fat Old Sun” and a fantastic version of “Run Like Hell”. “Money” might miss Waters’ distinctive bass, but the bluesy lead guitar break that Gilmour pulls off is extraordinary, bringing the song to life in a way I hadn’t experienced before. Of the new material, “Girl With the Yellow Dress” is all ’60s European jazz and is backed by a quirky animated video, whilst “Today” has a guitar sound and beat reminiscent of “Another Brick in the Wall”. The new album is a little more punchy than its predecessor, “On An Island”. “Time” is the first encore, and I am surrounded by an audience which has been transported to its student days, when they played this song in their bedrooms, lights off, smoking something they probably shouldn’t have been, lost in the music. 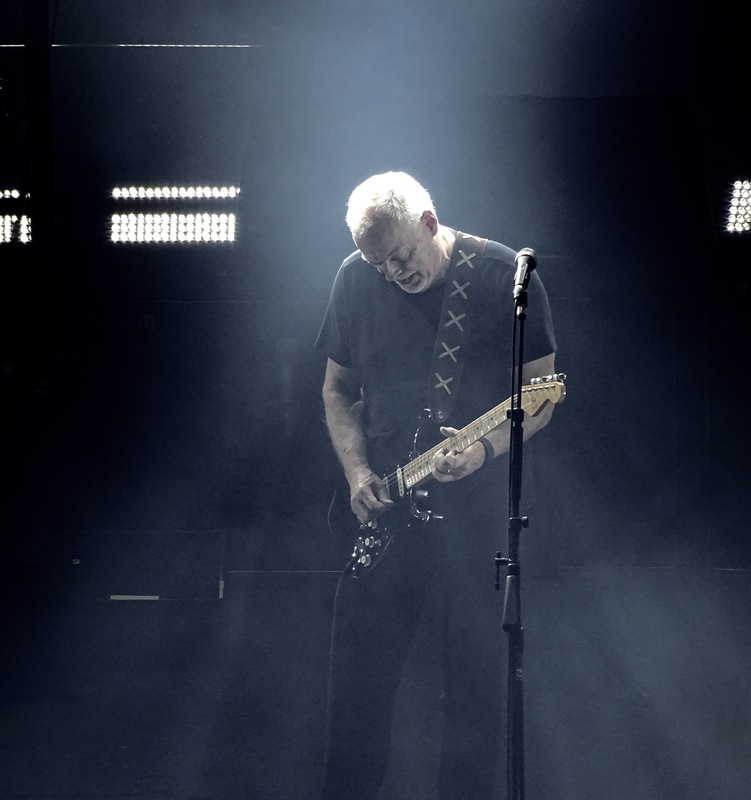 The final track, perhaps inevitably, is “Comfortably Numb” a song whose origins date back to Gilmour’s first 1978 solo album, recorded in the south of France, and from which came the first demos of the song. “It was too near the end of the sessions to progress it” said Gilmour later. 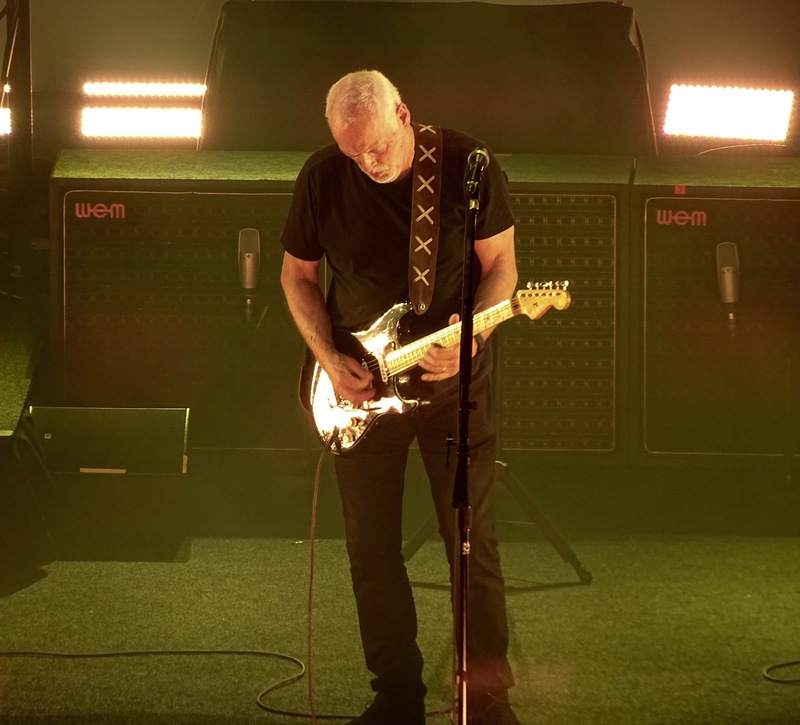 Tonight, as the Royal Albert Hall is bathed liberally in a lattice of lasers and Gilmour flicks off more tasteful licks than would feature in an entire box-set of “The Great British Bake-Off”, it is a tour de force. WEM speakers? !…i love that…such a listenable player. The sound really was crystal clear. Pink Floyd has always been good with that I believe. Fingers? Yes. Most of the guitarists I really admire who have a distinctive style have said similar things. Of course, the equipment is part of it, and Gilmour is heavily associated with the Stratocaster and, to a lesser extent, the Telecaster. On the other hand, the Stratocaster is associated with Mark Knopfler and he sounds quite different. The solo in “Stairway to Heaven” was played on a telecaster, and sounds quite different. 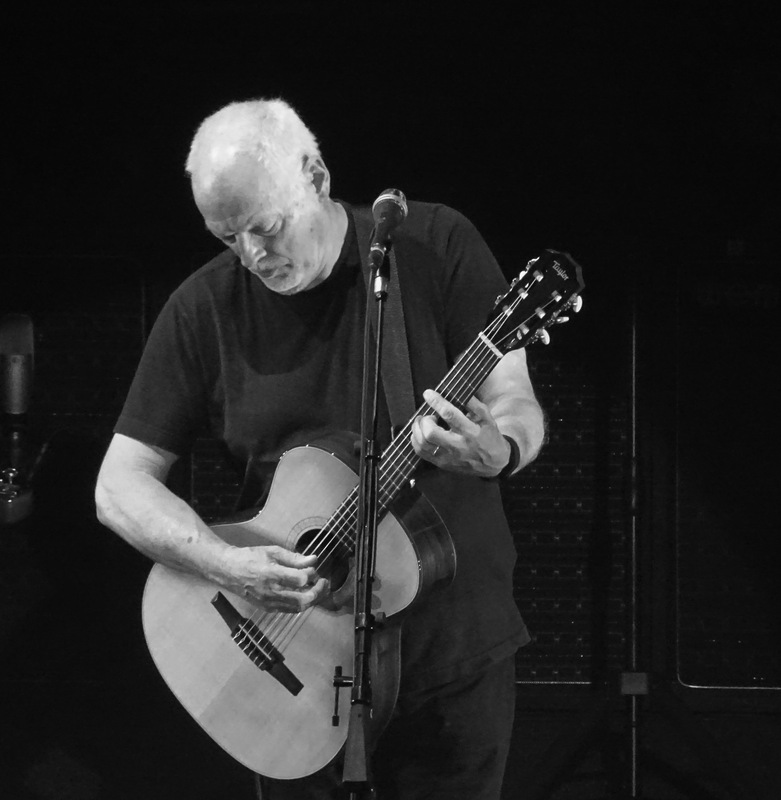 Gilmour once remarked that he bends strings to disguise his lack of technique. Maybe that was tongue-in-cheek, but his blues licks are really unique in the world of progressive rock. As are backing vocalists who are not part of the core band. Equipment is part of it, though. Apart from the guitars and WEM speakers, there were trusty HIWATT amps in his rack. Of course, it’s Phil Manzanara. Guy Pratt was on bass: long-time post-Waters Floyd man and son-in-law of Rick Wright. I was in Oberhausen for the only concert in Germany. I was surprised and delighted to hear “Fat Old Sun”. I like Atom Heart Mother, but not much has been played from it in a long time. Thanks for the correction. Late night last night! I made a mistake as well: Manzanera, not Manzanara. Sounds like a great concert. Shine on You Crazy Diamond alone would be worth going for. I saw the Brighton warm up gig and, having seen Pink Floyd on every tour since 1980’s Earl’s Court The Wall, can confirm the videos Gilmour used for the PF numbers were the original ones. Indeed, the DSOTM ones were from pre-1980. 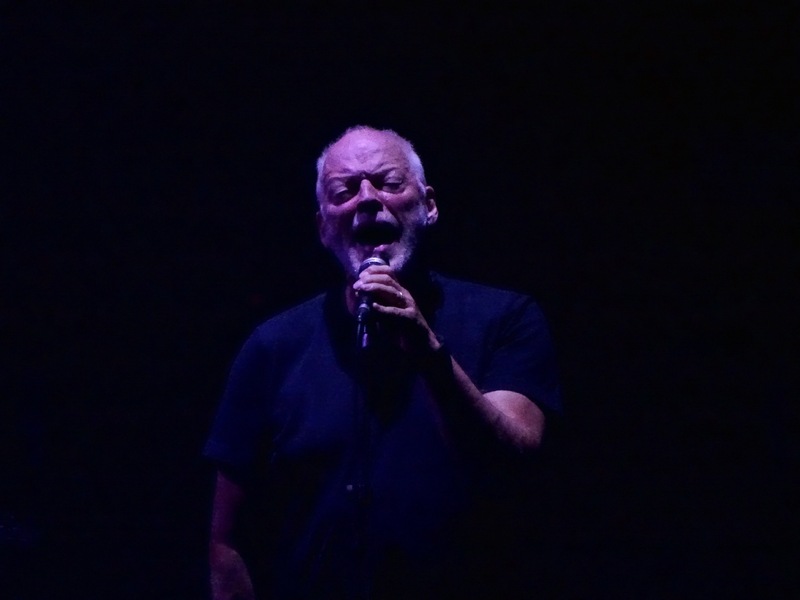 I thought the new Rattle That Lock numbers held up well live, and Gilmour seems to have found a good place for himself with this album and tour. I do hope he’ll do a live DVD of it! You’re welcome! And thanks for confirming what I suspected about those films. Seeing that circular projection screen was very suggestive of the footage of old Floyd gigs that I have seen. Here are some photos from the Shine On Tour 1975 from front row center, certainly not as clear as yours. The circular “trampoline” screen can be seen faintly in some photos. I remember during Us and Them slo-mo of a sea of pedestrians walking perfectly to the beat. The whole DSOTM video was historic to see. Glad you got to see him live, I saw the On an Island tour here in L.A.; Crosby and Nash were at that one too.
. . . and then there was the DSOTM debut at the Hollywood Bowl in 1972 – 6 months before the album’s release. You can see Waters scream as I snapped this right at that point in Careful with that Ax, Eugene. Oooh, very nice. Front row and centre! I was not, but had the advantage of a more modern camera. Looks like you took one of those during Time, as it is the same video as I saw the other night. Thanks for sharing – fascinating stuff. One of my friends was there at this show. He enjoyed it too. I’ve been listening to the new album and I’m glad Gilmour has shed the Floyd sound – well, mostly – and is making music different from that. 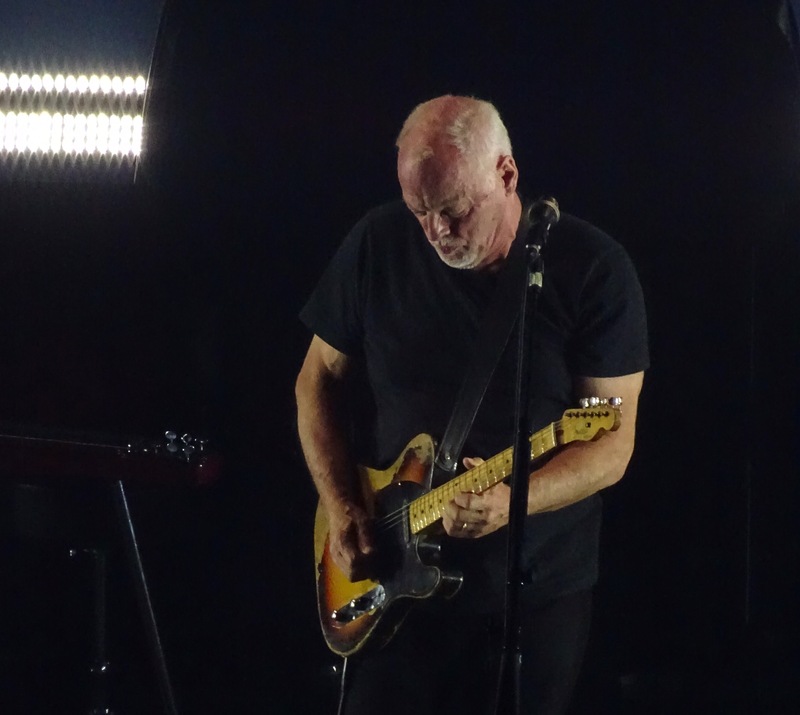 My previous glimpses of Gilmour have been fleeting….Nice! Yes, and it was playing in the background as he played the song. It’s good isn’t it?